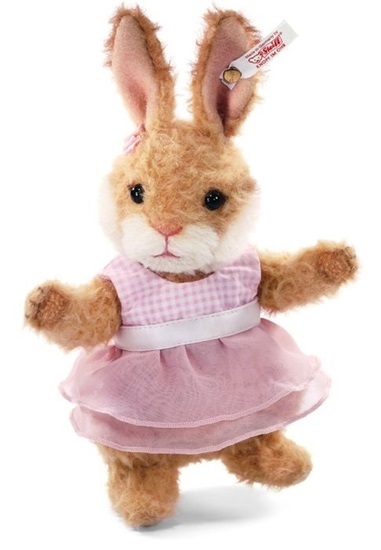 This petite Rabbit by Steiff is the offspring of Valentin and Velentina. In the Spring of 2013, Valentin and Valentina became the proud parents of Valerie, a petite rabbit, measuring not quite 7 inches. She is made of high quality curly blonde alpaca, and is wearing a pale pink dress of tulle and gingham. Valerie has a hand-stitched nose and mouth and has airbrushing detail on her nose, bottom lip, ears, and felt paw pads. She is jointed at her neck , and has two delicate pink roses on her right ear. Valerie is a world wide limited edition of 1500.